If you have not seen our past Support Playbook editions, we highly recommend taking a few minutes at the end of each month to browse these emails. They contain a recap of the month’s product enhancements, administrator tips & tricks, frequently asked support topics, and more. June was another feature-heavy month as a few big items were released. 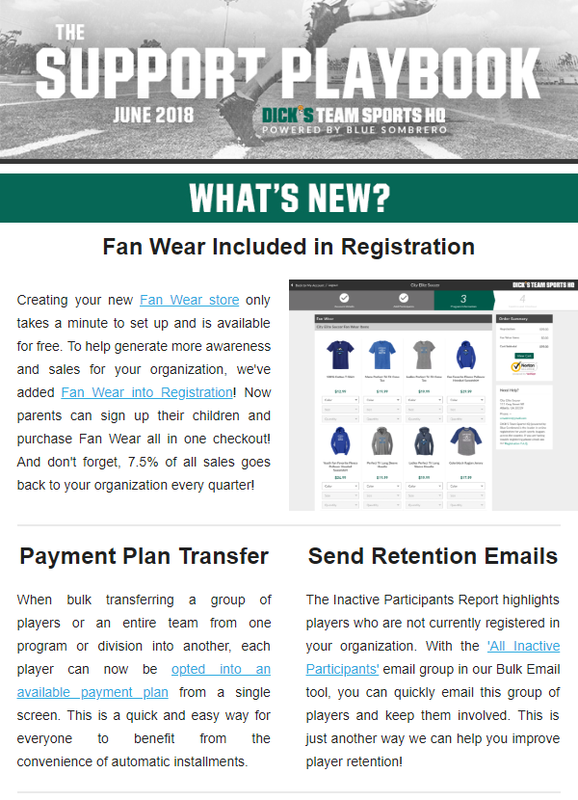 Fan Wear is now included in the registration process, we added a new email group to assist with player retention, it is now possible to opt players into payment plans when a bulk transfer is initiated, and our Registration Listing module now features a new countdown clock! A new Playbook and blog series, Market Your League, kicks off in June and July, and is geared towards helping volunteers learn best practices around gaining exposure for their leagues. Stay on top of our blog page and future playbook editions to gain helpful tips and tricks from our marketing experts. Finally, Don’t Forget about some important guidelines around our Mass Text feature. And for the accountants, or non-accountants doing an accountant’s work, there are a series of reports built into Team Sports HQ that will give you insight into your revenue and organization’s bottom line.